At Campsite Ferienparadies Natterer See in Natters (Tyrol) camping costs as little as €20,- per night during low season with CampingCard ACSI. At one of the 176 touring pitches you will get a discounted rate during the period 10-01-2019 - 13-04-2019, 05-05-2019 - 08-06-2019, 23-06-2019 - 30-06-2019 and 01-09-2019 - 30-11-2019. At this campsite you can not only use your CampingCard ACSI for inexpensive camping, you can also use your ACSI Club ID (as an alternative ID). 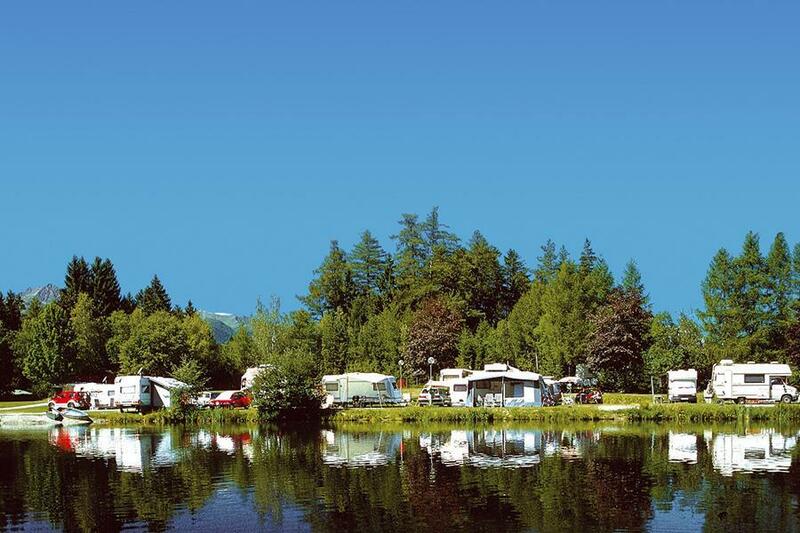 This lovely campsite is positioned by two small lakes. By one of the lakes the pitches are terraced and by the other lake they are level. There is a very extensive entertainment programme for everyone, kids and adults, also sports activities. Exclusive toilet facilities. Just 7 km from Innsbruck. This is a large, very busy site in a nice location close to Innsbruck. The site was full when we visited during a weekend in June and an overspill field was being used. The site seems very popular with families. The site has two distinct areas, a lower level based around a swimming lake, and upper terraces. Each area has its own toilet/shower block. The facilities in the lower section are amongst the best you’ll find on a campsite. The other block is perfectly adequate. Reception staff speak good English and are helpful. The site includes a restaurant with a dining terrace bordering the lake and there are various facilities for kids water sports on the lake. There is a shop stocking the essentials and a free shuttle bus into Innsbruck which we used and it was very good. The lake area and facilities are used by locals, particularly at the weekends and it gets very busy and very noisy. The pitches on the terraces above the volley ball court and kids play areas are best avoided if you enjoy tranquility - the shouting and screaming goes on all day and late into the evening! Overall this is a good site, probably best enjoyed by families with children or young people. Others seeking a relaxing and peaceful site might prefer somewhere else or choose their pitch carefully. Still a fantastic place in 2018. We stopped here on our 5 week tour around Europe, staying at 12 sites in total. This was the best in terms of quality facilities and general site layout. Friendly helpful staff. Pros: facilities are superb, almost boutique hotel. Scenery of the Torilyian mountains from the panorama plots is great. Cons: there are only 6 plots which don’t incur an extra fee on top of the ACSI. But having said that the most expensive panorama plots were extra per night. Considering the quality of site we think it was worth it. Remember to purchase your road toll vignette before entering Austria. Available from petrol stations near the border. Another great stay at this fantastic site. The location is beautiful with amazing views (sunsets particularly spectacular). The free bus pass into Innsbruck (mostly hourly) is great and there's loads to do in the city , especially the old town. There are many beautiful walks (and bike rides) from the site and in summer months the lake is popular for swimming. The showers, washrooms and toilets are second to none (only criticism is that hand dryers in toilets aren't very efficient!). The staff couldn't be more helpful. It's well worth paying the extra for a comfort pitch - the standard ACSI pitches are quite small and not in the best locations. Comfort pitches and above all have private water connection and drainage. Small shop is well-stocked but a bit pricey. This is our second visit to this site and it won't be our last! the best place!!! !great staff, including free bus ticket to city, toilet and showers like at home. just perfect, defently will come back. As all the reviews say fabulous facilities with hotel style showers. Location lovely with lots of well signposted walks. Reception staff very friendly and helpful . Free bus to Innsbruck but be warned that if you take a dog some drivers request they are muzzled - we were ok going to Innsbruck but driver on return journey refused to take us. Resturant good although kitchen closed at 8.30 when we were there. Shop well stocked. Definitely recommend. This is the best run and maintained site we've ever visited with exquisite, modern, spacious and basically wonderful washing facilities!! Family run with energetic and friendly staff always on hand to assist. It is a large site with four separate defined areas. In the lake area there are actually only about five with direct lake view. We were in 'West' area where the pitches were terraced but flat and spacious and we paid extra for a luxury pitch with water and drain. We dined twice in the restaurant where the food was excellent and the staff very hard working and priest sly and helpful. We stayed for five nights at the end of May (last week of their half term holidays) so a couple of days the site was packed but when we left on 30/5 it had quiet ended down. There are loads of lake and other kids activities and I'm sure I summer very busy with families. The site is easy to find and only 14 km from Innsbruck plus with the free camping GasteCard it gave you free transport (about every hour). Innsbruck has plenty to seen and do and the Innsbruck card was worth getting but go in early to get full use of it. The funicular, plus two cable cars gets you to the top of Nordcap which is amazing on a clear day - make sure you walk the extra bit to the very top for 360 degree views :) So an excellent site and fully recommended. An excellent busy site. Site is laid out in different parts with a choice of pitches. Option to upgrade from the acsi CC price. Pitches by the lake or in woods or on the terraced section over looking the mountains..couldn't beat the views. Large pitches Easy access. As with all Austrian campsites we have stayed on there is a tourist tax and umwelt tax to pay on top of your acsi price. Access was ok only one small section to climb uphill to natters approx 1km and then the turn to the campsite road is single width don't be put off. The sanitary facilities have to be seen to be believed! Pan pipe music playing, heated floors, huge showers, hot water with strong pressure and they look like hotel showers. There are woods at the entrance to the site to go hiking in or take the dog for a walk. Guest card allows free bus to innsbruck. Very helpful staff. Cycling and hiking trails from site. Natters very pretty. Good supermarket in natters as you enter village on right. Would visit again. Before going here we read the reviews, all exceptionally good. Don't get me wrong this is a good site but does not deserve the reviews it has, maybe it was better a few years ago. We were allowed to choose a pitch but our caravan would not fit onto a standard pitch so an extra small amount for 100m2 pitch. still access was very difficult but we managed to find one where we could cope. Pitches were very wet and muddy. Area is stunning with great views from the site, but the toilet block, whilst good was not as good as previous sites we have visited on out trip. Free bus to Innsbruck was a nice addition. An excellent busy site. A mix of those staying and one night stopover. The 18€ went to 23.5€ after tax etc added on. We had paid 1€ extra for a better pitch which is worth while. A range of pitch sizes and location is available for more Euro,s. Toilet block facilities to be seen to be believed. In the men's there were rooms which contained a urinal, toilet, washbasin, soap container and hand drier. 16 amp electricity which was not metered. Would you like to book Campsite Ferienparadies Natterer See or request more information? You can do both using the information below or by visiting the campsite's website. A13 Brenner motorway, exit 3 Innsbruck-Süd/Natters. Follow the signs direction Natterer See. CampingCard ACSI will send your information request to "Campsite Ferienparadies Natterer See".